The U.S. Forest Service this week finalized a litigation settlement that will allow the Water Supply and Storage Company, a northern Colorado ditch company, to continue to use Long Draw Reservoir on the Arapaho-Roosevelt National Forests, and will launch a large-scale native trout restoration program for the Cache la Poudre river headwaters within the Forests, including the Neota and Comanche Peaks Wilderness Areas, as well as in Rocky Mountain National Park. Completion of all project elements is expected to take more than 10 years, but when completed will provide for a connected “metapopulation” of trout across the watershed – the largest such restored native trout habitat in Colorado. The native trout restoration project will span more than 40 miles of connected river and multiple lakes, as well as Long Draw Reservoir itself. To protect the watershed from invasion by non-native species, fish barriers will be established on the Grand Ditch and on the mainstem Cache la Poudre below its confluence with La Poudre Pass Creek. Within the watershed, temporary barriers will also be installed to enable fishery biologists to complete restoration of native trout one section of the basin at a time. After installing temporary barriers, biologists will remove non-native fish from the upstream areas. Once the areas are confirmed to be free of non-native trout, they will be re-stocked with native greenback cutthroat trout. Work will be done in collaboration with the USDA Forest Service, Rocky Mountain National Park, the U.S. Fish and Wildlife Service, Colorado Parks and Wildlife, and Colorado Trout Unlimited. Under the settlement, a trust will be established with $1.25 million from the Water Supply and Storage Company for purposes of funding these restoration activities. Colorado Trout Unlimited will serve as the Trustee, while the U.S. Forest Service will be the lead agency for project implementation. “The settlement finalized today is a great example of how open dialogue and a spirit of cooperation can yield conservation solutions. After years of litigation and debate, the U.S. Forest Service, National Park Service, Water Supply and Storage Company, and Trout Unlimited have agreed to launch a collaborative restoration project for Colorado’s state fish, the greenback cutthroat trout, which will be the largest native trout restoration effort in Colorado history. “Over the next decade, we will be restoring a true Colorado native to the Cache la Poudre headwaters in spectacular alpine wilderness within both Rocky Mountain National Park and the Arapaho and Roosevelt National Forests. The watershed will be a stronghold for native trout, helping secure this piece of Colorado’s natural heritage for generations to come. by Kirk Deeter, editor of TROUT Magazine and the vice president of Trout Media for Trout Unlimited I love catching big fish. How can you not? After all, size is the benchmark that is ingrained to matter most to many anglers. My mother doesn't fish much, but when I call her to say I spent the day fishing, she always asks: "Did you catch any?" Question two… "How big?" The concept of "trophy fish" is usually about size too. I'm starting to rethink that a bit, though. If you go fish in a place where the fish are stocked, and some of the trout are 20 inches long when they are put in the water to begin with, well, isn't that more like a "participation trophy?" I'm a bit more old-school, in that I think a trophy should be a reward for lots of hard effort and good performance. I love it when people catch big Michigan brown trout at night… you know, this fish you think is in the bottom of that perfect run, but you've never been able to get it to eat. Sometimes it takes a better angler than me to revive my faith. A small, native cutthroat is also a good "trophy" in my mind, especially when I have to walk a few miles to find them (though I admit I don't have to make any miracle casts to catch them). They also tend to represent the effort of a lot of people who work hard to keep them around. Denver Water recently filed its application for an amended license with the Federal Energy Regulatory Commission (FERC) for its Gross Reservoir/Moffat Firming project. The filing included valuable new commitments to benefit native trout in headwater watersheds within the Fraser and WIlliams Fork basins - and that's good news for cutthroats and the anglers who value them. More than two years ago, Denver Water came to an agreement with Grand County and TU that incorporated a variety of river protections and enhancements in conjunction with their Moffat Firming Project - measures that we agreed would result in a healthier Fraser and Upper Colorado River system than without the Moffat project. The agreement was a great model of collaborative conservation to achieve better outcomes than we could achieve alone. These commitments were incorporated in a settlement agreement between Denver and the US Forest Service for the FERC licensing process, and represent another important step in ensuring that the impacts of Denver Water's Moffat project are mitigated. Denver Water has said that they intend to leave the watersheds impacted by their project in better health than they are today - and these new commitments to native trout restoration in the Williams Fork and Fraser basins are another positive move in converting those words into on-the-ground action. Kudos to Denver Water and the US Forest Service for launching a strong partnership to benefit native trout! Colorado Trout Unlimited has been a proud partner of a Trout in the Classroom program, in which middle or high school level classrooms raise trout from the egg to the fry life stages. At the end of the year-long course, the classroom releases the trout into a local lake or stream- connecting the students back to their local environment. During the year each teacher tailors the program to fit their curricular needs. Therefore, each program is unique. TIC has interdisciplinary applications in science, social studies, mathematics, language arts, fine arts, and physical education. The program helps students learn hands on about water quality, biology, population studies, and environmental issues. "I really like having the tank in my classroom because it’s a new lesson every day," said Mike Sanchez, TIC teacher at Academy High School in the Maptleton School District. "There’s water chemistry, population dynamics, evolution, ecology, fish anatomy, etc. You can always come up with something to talk about and the kids are genuinely interested." In 1997, TIC was started in New York through the efforts of the late Joan Stoliar, volunteers from Trout Unlimited and the Theodore Gordon Flyfishers. Since its inception, TIC in NY has grown from four classrooms to more than 200. This rapid growth is a testament to the program’s adaptability, effectiveness, and ability to interest students of all ages and backgrounds. In Colorado, there are currently six active tanks involved with the TIC program. These classrooms are located all over Colorado. CTU helps these classrooms by assisting in obtaining trout eggs, coordinating supplies, and helping with the required disease testing prior to the release. The trout fry are released into a local river, stream, or lake. This allows the kids to be connected and engage with their local environment and ecosystems. Some of the sites teach kids about fishing and how it relates to conservation and the fish they raised. "We also spend a few days enjoying some fishing at local ponds and the stocked Lake Lehow in Littleton," said Sanchez. "Kids appreciate the biology and learning how to fish, it’s a great week." Parents have also gotten into the fun through TIC. "While the program is targeted at the kids, the teachers involved have noted that many of the parents have been excited about the tanks as well, not only keeping up with the egg/fry progress through their children, but visiting the tanks during parent-teacher conferences, involving the whole family in the educational process," said Bloodworth. If you or someone you know may be interested in developing a Trout in the Classroom site at your school, please contact Jeff Florence, for more information! 1. Use Yarn- many of you reading this may have heard this recommendation before, but it bears repeating. I feel that strongly about it. Simply put, yarn indicators are WAY more sensitive than plastic bobber-style indicators. Fish this time of year can be pretty lethargic (compared to summer) and typically won’t eat your flies with much aggression. Oftentimes your yarn won’t even dunk underwater but rather just ‘pause’ or ‘lean over’ when a fish strikes. If you’ve never used yarn indicators before, be prepared to be amazed with the sensitivity you’ll get. Side note- tips for yarn success- carry several and liberally apply some fly floatant before starting the day. Be prepared to dry off your indicator every couple hours and reapply. If you decide that your indicator is too waterlogged after a few hours, simply swap it out for a fresh one. While I realize these do require a little more maintenance than a thingamabobber, the fact that it leads to more fish in the net throughout the day is always worth it to me. 2. Putty and Split Shot- if you’re not using both split shot AND putty, you’re really missing out. Flows are at their lowest levels of the year and being able to dial in the weight on your nymph rigs is paramount to success. Any of the commercially made tungsten putties will work great so don’t get too caught up on which ‘brand’ to buy. Here’s how I put both split shot and putty to use for me this time of year. To start, select the size of split shot that will get you by in the shallowest water you’ll be fishing. Anytime you come to deeper water, simply pull out a little putty and apply it directly on top of the split shot, rolling it into a nice round ball. Voila. That’s it! Throughout the day you can add and remove putty as necessary to make sure you’re always getting your flies right down into the fishes faces. When you decide you need to take off a little (or all) of the putty you added, simply peel it off and place back in the original container. You can use and reuse tungsten putty for months on end before running out. The best part of using tungsten putty is that it avoids having to constantly pinch and remove split shot throughout the day. This will help protect your light tippets and is also just a whole heck of a lot faster way to make weight adjustments! 3. Never make a cast standing in the water that you could have made standing on dry ground. This is another HUGE one for me, but is a mistake I see anglers make time and time again. Whenever you approach a likely looking area, always make it a point to fish it while keeping your wading boots on dry ground. Avoiding splashing around, crunching rocks, and in general- disturbing the water with your steps- is always going to leave the fish feeling much more at ease and in turn- more eager to eat your flies (this rule should actually be applied year round). 4. Tighten up your flies- If you don’t fish your flies spaced closely together during winter, I’m confident you’re missing out on a few fish throughout the day. I always like to say that a wintertime tailwater trout lives in a shoebox. (i.e. if you put a trout in a shoebox, it doesn’t have much room to move side to side). If I’m not getting my flies in this ‘shoebox’ zone, my confidence in getting an eat goes down drastically. My rule for spacing my flies during winter is to make a fist, and then extend my thumb and pink in opposite directions. This is the spacing you should be using- approximately 10” or so. If you’ve never fished your flies this close together, consider yourself warned- it’s probably going to seem a little weird at first. One thing I can promise you though is that you’re going to need your net more throughout the day if you give it a try! 5. Watch the bubbles- we’ve already talked about indicators and weight, and I firmly believe that one of the biggest reasons people don’t catch as many fish as they should is that they’re simply not getting down to them. Next time your nymphing make sure to keep an eye on the bubbles on the surface. What are they doing? Are they moving the same speed as your indicator? If so, this is a dead giveaway you’re not getting down to the fish. Most fish this time of year are sitting very close to the bottom. The water on the bottom of the river is moving slower than the water on the surface. If you’re indicator is floating the same speed as the bubbles on the surface, this means that you’re not getting down to the fish. Simple as that. The goal is to always have your indicator floating SLOWER than the bubbles on the surface. This can quickly be achieved by adding a little more depth and/or weight to your rig. If you’ve never paid attention to this before I think you’ll be amazed at how much of a difference it makes and how quickly you are now able to dial in your rig, ultimately achieving a perfect drift to the fish! Trouts Fly Fishing is a full service fly shop located in the heart of Denver, CO between Downtown and Cherry Creek North. A second location was established in Frisco, CO located right on Main St. In addition to selling fly fishing goods, Trouts also offers a wide selection of fly fishing classes, guided trips and destination travel options. Some of their trips include both float fishing and wade fishing on the Blue River, Colorado River, Williams Fork River, Eagle River, Roaring Fork River, Frying Pan and Arkansas River. Trouts has been proudly serving the angling community for over 15 years. 2016 was a big year for Colorado TU, the last 11 months have seen challenges present themselves from protecting our headwaters from acid mine drainage, to making sure our public lands remain in public hands, to ensuring the state's quality of water and natural habitat. While these challenges threatened our rivers and streams, the work by TU and it's chapters, made sure these threats remained just that and our watersheds remained protected. CTU also embarked on programs that would help sustain conservation and fishing for years to come. We engaged the next generation of river stewards through our Youth Camp, introduced a new group of kids to conversation through fly fishing, reintroduced native greenback cutthroat trout to their home watersheds along the front range, and made on-the-ground improvements to our state's fisheries through our chapter's volunteer efforts. There were many great success stories over the last year that will be covered in the 2016 Year in Review coming out early 2017. The few stories listed below are highlights of the last year for CTU and just a glimpse into the great work done by the TU staff, our chapters, volunteers, and partners! Stay tuned for the 2016 Year in Review for more articles covering all of the great work done in Colorado! Throughout the past decade, Colorado TU has also been involved in advocacy and litigation to help protect the Roan in the face of proposed oil and gas development. The legal battle culminated in productive settlement talks that produced the new Roan plan that BLM approved in November. For the next 20 years, the most sensitive watersheds atop the Roan will remain unleased, while responsible development will be allowed on other areas on and around the Plateau that are closer to existing oil and gas infrastructure. Continued improvements in directional drilling technology over those years could make it possible, by the time BLM next updates the Roan plan, to extend development to natural gas reserves below the Roan without needing to sacrifice the valuable habitat on its surface. This agreement is a great example of how balance can be achieved when all parties sit down and try to listen honestly and respectfully to each other to craft a solution. Concurrent with the Roan decision, The BLM also issued a decision canceling 25 contentious oil and gas leases within the Thompson Divide (the leaseholders to be repaid from government funds), while maintaining 40 other leases in surrounding lands – mostly closer to existing development areas. As with the Roan, the decision reflects a responsible balance between protecting our most valuable fish and wildlife habitats and enabling responsible energy development to move forward on public lands. Unlike the Roan, this decision does not yet reflect a larger consensus among conservationists and industry, nor does it provide longer-term protection for the Thompson Divide. The decision was a necessary victory in protecting the Thompson Divide from the imminent threat of oil and gas drilling, and TU remains committed to working with the BLM, Forest Service, ranchers, local governments, and the oil and gas industry to achieve a long-term solution that includes permanent protection of the Thompson Divide as part of a larger, responsible plan for energy development in the region. Trout Unlimited and a coalition of agencies, concerned citizens, and conservation and sportsmen groups rallied to defend Colorado’s water quality standards for temperature in coldwater streams. The Colorado Water Quality Control Division (WQCD) proposed changes in standards that would have raised standards for water temperature to levels that could prove fatal to trout in spring and fall seasons and year-round in mid-elevation “transition” waters. The proposal was based on flawed science and failed to adequately protect coldwater fisheries and to address the varied factors that influence temperature regimes in natural streams. Thanks to the efforts of TU and our coalition partners, the Water Quality Control Commission (WQCC) rejected the proposed changes, keeping in place the protective temperature standards that currently apply to coldwater streams. It was an impressive team – including Colorado Parks and Wildlife, the Colorado Wildlife Federation, the Environmental Protection Agency (EPA), Western Resource Advocates, and others. The proposed changes would have weakened water temperature standards for around 1/3 of Colorado’s trout streams, based solely on their elevation, allowing the fish’ stress levels to increase and ultimately cause problems for feeding, growth and movement. According to the EPA, the proposed standards for lower elevation coldwater streams could have actually proved lethal to trout exposed to them over seven days. Colorado TU teamed up with Colorado Parks and Wildlife to reintroduce Greenback Cutthroat trout into their native watersheds all along the Front Range. Efforts this past year including spawning Zimmerman Lake, receiving grants to help improve the Mt. Shavano fish hatchery that raises Greenbacks, and expanded Greenback efforts to educating the public on why all native trout reintroduction is vital to our ecosystems. CTU has also worked with Parks and Wildlife on preliminary plans for a fish barrier on Rock Creek that will eventually hold Greenbacks. CTU volunteers worked with CPW on the beginning stages of the project by stocking fish in a section of the stream. At this time of year, we all take stock of the many things for which we can be thankful. Last week, the Bureau of Land Management and Department of Interior gave Colorado hunters and anglers two more reasons to give thanks: the agencies announced two final decisions on oil and gas leasing that protect key backcountry habitats on the Roan Plateau near Rifle and the Thompson Divide near Carbondale - two of Colorado's "Last Best Places." The Roan Plateau is home to outstanding big game habitat and unique native trout like those pictured here. Trout Unlimited has been hard at work on the Roan for more than two decades, with many hundreds of volunteer hours invested by the Grand Valley Anglers chapter on habitat protection and improvement projects from instream structures to riparian fencing and replanting. TU also helped install a fish barrier to protect native cutthroat trout habitat being restored by Colorado Parks and Wildlife. Throughout the past decade, Colorado TU has also been involved in advocacy and litigation to help protect the Roan in the face of proposed oil and gas development. The legal battle culminated in productive settlement talks that produced the new Roan plan that BLM approved last week. For the next 20 years, the most sensitive watersheds atop the Roan will remain unleased, while responsible development will be allowed on other areas on and around the Plateau that are closer to existing oil and gas infrastructure. Continued improvements in directional drilling technology over those years could make it possible, by the time BLM next updates the Roan plan, to extend development to natural gas reserves below the Roan without needing to sacrifice the valuable habitat on its surface. This agreement is a great example of how balance can be achieved when all parties sit down and try to listen honestly and respectfully to each other to craft a solution. The Thompson Divide (including Thompson Creek pictured here) makes up more than 220,000 acres of federal land in Pitkin, Garfield, Gunnison and Mesa counties and contains some of Colorado's most productive habitat for big game, cutthroat trout and numerous other native species. The area is used by more than 10,000 resident and nonresident big game hunters every year and serves as the headwaters to some of Colorado’s most popular fisheries including the Roaring Fork, North Fork of the Gunnison, and Crystal River. Concurrent with its Roan announcements, the BLM also issued a decision canceling 25 contentious oil and gas leases within the Thompson Divide (the leaseholders to be repaid from government funds), while maintaining 40 other leases in surrounding lands - mostly closer to existing development areas. As with the Roan, the decision reflects a responsible balance between protecting our most valuable fish and wildlife habitats and enabling responsible energy development to move forward on pubilc lands. Unlike the Roan, this decision does not yet reflect a larger consensus among conservationists and industry, nor does it provide longer-term protection for the Thompson Divide. The decision was a necessary victory in protecting the Thompson Divide from the imminent threat of oil and gas drilling, and TU remains committed to working with the BLM, Forest Service, ranchers, local governments, and the oil and gas industry to achieve a long-term solution that includes permanent protection of the Thompson Divide as part of a larger, responsible plan for energy development in the region. These victories came only after many years of hard work and advocacy by Trout Unlimited staff and volunteers. For many years, we have worked in partnership with local partner coalitions to achieve balanced solutions that recognize that some areas are too special to drill, while others are important parts of meeting our nation's energy needs. The support you and our other members have given over the years enables us to tackle these vital but challenging issues, making the long-term commitment that it takes to achieve these kind of successes. 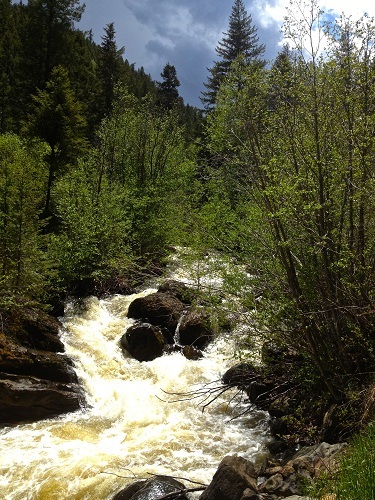 By: Hillary Walrath, Henry’s Fork Project Manager, Wyoming Trout Unlimited A small creek in southwest Wyoming just got a big upgrade. This November, a push-up style diversion was improved to a fish-friendly rock vane structure with a head-gate, reconnecting approximately 6 miles of habitat for the native Colorado River cutthroat trout that reside there. This project was unique in that it all began with the local school. Trout Unlimited partnered with the McKinnon Elementary School to study their home water, the Henry’s Fork River, through the Adopt-a-Trout program. This particular program involved tagging Colorado River cutthroat trout with telemetry tags and tracking their movement from 2014-2016. The students each got to “adopt” their own fish and follow it throughout the year. They learned a variety of river ecology lessons, including fish anatomy, macroinvertebrate identification, applying the scientific method, riparian ecosystems and many more. They also had to map where their fish moved using Google Earth. Using two years of the Adopt-a-Trout data and an instream flow study that TU conducted on Beaver Creek, a major tributary, we discovered that there was a push-up dam near the confluence to the Henry’s Fork that was not allowing fish passage for a critical part of the year. None of the students’ fish were able to pass that point during the summer months. So, TU collaborated with the Lonetree Ranch to develop a fish-friendly diversion that would still allow them to receive their irrigation water, but would allow for fish passage during low flows. A head-gate was also installed so that they could turn the ditch off when they no longer needed to irrigate, leaving more water instream for the trout. Thanks to the funding provided by the Wyoming Landscape Conservation Initiative, the Wyoming Wildlife Natural Resource Trust and the Natural Resources Conservation Service, the project was able to be completed November 2016. This is just the first of many projects that will be done along Beaver Creek to benefit native trout. Over the next year, the McKinnon students will be assisting with vegetation planting and monitoring on several sections right above the diversion to provide better cover and reduce stream temperatures during the summer months. Projects like these are not only reconnecting populations of native trout, but reconnecting kids to “their” fish and river. Registration is now open for Colorado Trout Unlimited's Fall Board and Leadership Meeting. This meeting is a great opportunity for you to network with other TU leaders in the state and learn about what projects are currently happening. There will also be a tour of Hermosa Creek where participants will get a first hand look into a collaborative conservation project. This meeting will be held in Durango, CO the weekend of October 22-23. Click on the registration link to find the agenda and learn more about the details of the weekend. Two recent Durango Herald Articles talk about the improvements of the Animas and the future of Hermosa Creek. Trout Unlimited has been on the forefront on both of these positive subjects. The Animas River has shown signs of improvement as the fish population is providing "encouraging" signs. As the Animas continues to face adversity and hardship from acid mine drainage, low water flows, urban runoff, and higher temperature, Colorado Parks and Wildlife biologists have seen encouraging signs. The study showed more young brown trout were able to survive over winter. Rainbow trout also had plentiful numbers meaning the survival rate was rising. The amount of quality trout- 14 inches or higher- doubled from last year's study. While the Animas is improving, the future of Cutthroat Trout in Hermosa Creek also have a bright future as stream improvements have been made to prepare for Colorado River Cutthroat reintroduction. 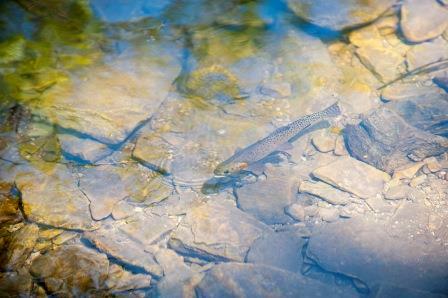 Vegetation was planted and spawning areas were made along the stream to sustain a healthy future Cutthroat population. At the October Board Meeting, participants will be able to take a tour of Hermosa Creek. The tour will focus on sites with the native trout project and visit some habitat improvements, tour participants will walk away with a better understanding of what it takes to work together and pull off a truly comprehensive conservation program.